The current Sonic was first introduced at the 2010 Paris Motor Show. When it first came out it was a great option, both due to the affordability and the cuteness of a small and cheap car. After six years, it’s gotten a bit boring, and it became forgotten, so Chevrolet decided to give it a large update ahead of the 2016 New York Auto Show. Yes, that’s right, but unfortunately, it’s still the same Gamma II platform, a platform older than half a decade. We saw the 2016 Sonic last year and complimented Chevrolet’s effort to at least try and improve the car. It may not have been successful with superficial updates, most of which were just on paper, but 2017 doesn’t just promise, it delivers. The exterior is different as is the interior, and there’s a lot more on the infotainment side of things. More on that later, but first let’s start with the most important aspect of a car like this. Its looks come to the first place pretty much. The chances are that most people who opt for a small cheap vehicle will go for the best looking one. Smaller cars share the same issues (small cabin, limited space, cheap materials), so the only real deciding factor between them for an average user is how unique the exterior is. The more distinctive and different it is, the better. First of all, let’s just start by saying the Sonic is a lot better looking in real life as opposed to what we can conclude just by looking the pictures. That may be an overly used phrase in the car world, but it is true this time. It’s not an especially good looking car, but the pictures don’t do it justice. It’s honestly not bad, and would give a lot of small cars a run for their money. We certainly recommend you to check this car out before you decide to buy any of its competitors. Chevrolet realized the value the Sonic holds for them, so they described it as the most affordable small car to come out of their factory. They claim it is fun and striking, but we’ll leave you be the judge of that. The body shape changes things a lot. The sedan is neither bad nor good, but the hatch, only being offered in RS guise is leaning towards the better side. We won’t directly say it’s great, but it isn’t bad. Let’s put it that way. The shell of the Sonic is entirely new for 2017. The styling has been influenced from the Cruze, the Trax, and even the Bolt EV. The new hood and the restyled nose give it a much more elegant look, freshening up the entire design. The grille is rather small and features the Chevrolet logo in the middle. On both sides, you’ll find the newly restyled headlights which aren’t round anymore but rather have a more conventional design and features. Right below the main grille there’s a considerably larger opening that shows part of the bumper while the rest is opened so more air could be delivered to where it is needed. The lower part of the grille is flanked on both sides with daytime running lights, and they can be obviously specified with LED technology, just like most modern cars. 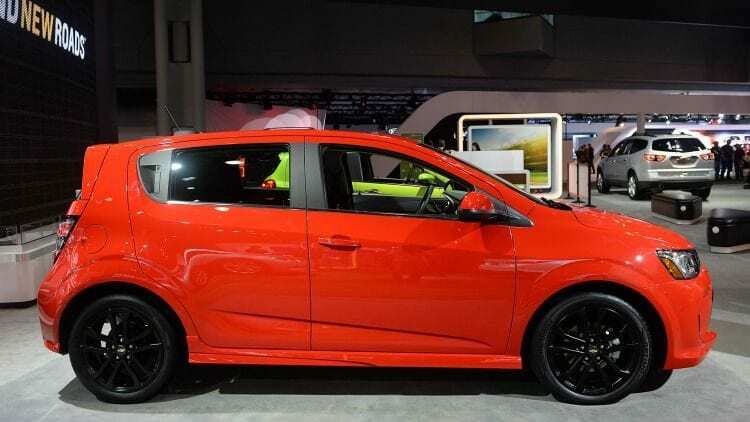 You don’t have to like the front of the Sonic, but you have to agree, it isn’t exactly an ugly duckling. The interior is yet to be described in full details, but we do know some general things. 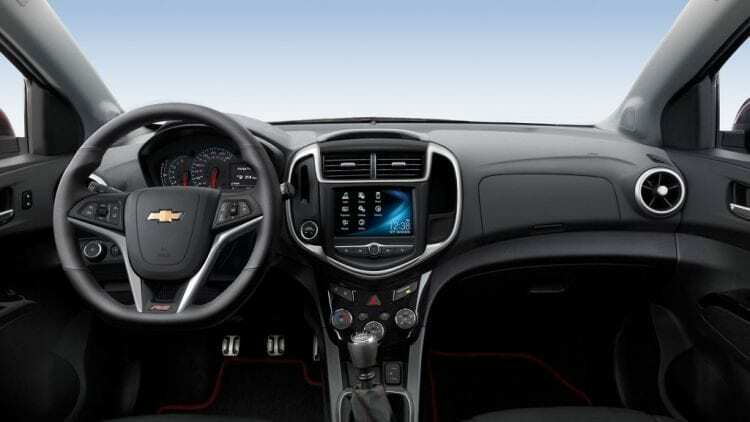 Things like a new gauge cluster with an analog speedometer and a new steering wheel for a more precise and direct steering. Since the first news, we were fortunate enough to take a closer look at the materials, and we have a few issues with it. Let’s get one thing straight first. For the price point, they’re selling it at; the following writing is almost completely obsolete. Okay, there are some competitors in the same price range with a lot better interiors, but they too lack in certain areas. Mostly is used plastic of not that great quality giving it gimmicky looks, and although the overall feel of the cabin has been improved from the old car, the fact that the old car had one of the worst cabins doesn’t say a lot. It’s by no means a deterrent from buying it if you were planning to since it’s to be expected, but it does make you consider spending a grand or two more to get another car with a nicer interior. There’s room inside, as much as a small car can have. If it has something going for it, apart from the flat bottom steering wheel, it’s the cabin space. The lack of features and any accessories means that everything could be minimalized which resulted in a decent amount of headroom and legroom for a car of its size. Get in one and decide whether the cabin is acceptable for your standards before buying it. The engine is a carryover from the previous gen. It’s a 1.8 four-cylinder unit developing 138 hp and 125 lb-ft of torque. It’s not that bad unit, making a decent amount of power for an economy car, but the optional turbocharged 1.4-liter four-cylinder is a lot better. It manages to extract the same amount of hp (138) but with more torque, 148 lb-ft to be specific. Not to mention the turbo noise present in the smaller engine, which is just cool sounding. The naturally aspirated engine is mated to a five-speed manual with the option of a six-speed auto, while the turbocharged one comes with a six-speed manual, and with the possibility to opt for the same six-speed auto. 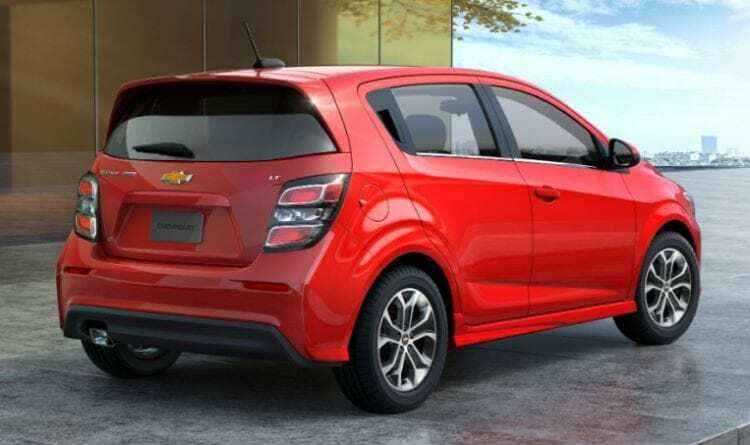 Performance figures are largely the same for the 2017 Chevrolet Sonic compared to previous year version, standing in at 9.7 and 7.8 seconds in the sprint to 60 miles per hour for the 1.8 and the 1.4 respectively. Top speed across the range is limited to 108 mph. The car shines where it’s supposed to, but expectedly with the turbocharged engine, you do get more. The naturally aspirated 1.8-liter returned 30 miles per gallon on the combined run, with the smaller but turbocharged unit managing 33 on the same route. 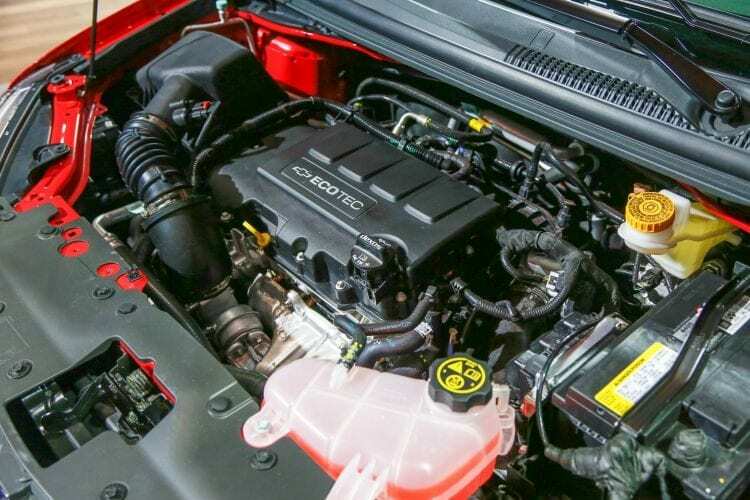 If you’re thinking of buying a 2017 Chevrolet Sonic, we strongly suggest you take the turbocharged engine. It’s faster, smoother, more economical and the six-speed manual is the best gearbox for this vehicle. The prices for the base model, however, should start at around $16,000 but no words on exact figures. There will be no major bumps compared to previous year model for sure.